Posted on September 28, 2018 | Comments Off on Why Garlic? Of all the medicinal plants used intensively in traditional medicine, garlic may be one of the most important. Widely recognized by modern science for its broad and beneficial effects on cardiac health, an abundance of scientific literature supports the consumption of garlic for its preventative characteristics in cardiovascular diseases. These include its ability to reduce blood sugar, serum cholesterol and triglycerides; balance inflammation and regulate blood pressure; as well as improve endothelial function and prevent atherosclerosis. In order to provide a consistent dosage, most of the studies relating to the health benefits of garlic involved the use of garlic supplements. Aged garlic extract (AGE), in particular, provides unique and potent sulfur-based compounds with powerful antioxidant and anti-inflammatory qualities. Several studies have demonstrated that AGE inhibits the progression of coronary artery calcification. One of the most compelling findings of a placebo-controlled double-blind study of AGE involved 72 participants who met at least two of the five criteria for metabolic syndrome, a rapidly rising threat to a long and healthy lifespan. An individual with three of the following health conditions–central obesity, high blood pressure, high triglycerides, low HDL cholesterol, elevated blood sugar and insulin resistance–would be diagnosed as having metabolic syndrome, which greatly increases diabetes and heart health risk. Researchers found the percentage of low attenuation (soft) plaque change was significantly greater in the AGE group than in the placebo group. Although the researchers suggest that further studies are warranted to evaluate whether AGE has the ability to decrease adverse cardiac events, the answer may lie in its ability to help inhibit or reverse early heart disease by stripping soft plaque buildup from artery walls. Per scientific studies, the organic compound, allicin, responsible for garlic’s flavor and aroma, acts as one of the most powerful nutritional antioxidants. Researchers, who set out to determine exactly what was responsible for garlic’s medicinal benefits, found that as allicin decomposes it rapidly reacts to neutralize free radicals. 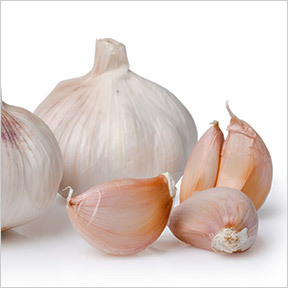 The antibacterial activity of garlic is widely attributed to allicin as well. Garlic has been proven to be effective against a host of bacteria, including salmonella and E.coli. Its anti-protozoal properties have demonstrated effectiveness against candida, giardia and more. In review, garlic’s more than 200 compounds are reported to enhance the immune system, to have antitumoral and antioxidant features and to be effective against bacterial, viral, fungal, and parasitic infections. Components include sulphur compounds, volatile oils, enzymes, carbohydrates, minerals, amino acids, niacin, vitamins A, C, E, B1 and B2, bioflavonoids and beta-carotene many of which offer cellular protection from the harms of free radicals and oxidizing agents. Kyolic® Formula 100 Vegetarian Cardiovascular by Wakunaga Pharmaceutical: This odorless, organic, scientifically researched aged garlic supplement supports and strengthens the cardiovascular system by reducing major risk factors, maintaining circulatory function, and promoting overall heart health. Free of dairy, preservatives, sugar, yeast and artificial ingredients. Organically grown, odorless vegetarian formulation. Fermented Black Garlic by Dr. Mercola®: Aging and fermenting enhances the sweetness and bioavailability of the beneficial nutrients including S-Allyl Cysteine. This product is formulated in support of healthy immune function and the maintenance of cholesterol and blood pressure levels already within the normal range. Soy and gluten free, Non-GMO formulation. Kyolic® Formula 104 by Wakunaga Pharmaceutical: This odorless, organic, scientifically researched aged garlic supplement supports healthy nerve function, overall cardiovascular health and the maintenance of healthy cholesterol levels already within the normal range. Free of gluten, dairy, yeast, sugar preservatives and artificial ingredients. Comments Off on Why Garlic? Tagged Fermented Black Garlic by Dr. Mercola, Kyolic® Formula 100 Vegetarian Cardiovascular by Wakunaga Pharmaceutical, Kyolic® Formula 104 by Wakunaga Pharmaceutical, Why Garlic?